Remember the kid from high school who everyone liked and everyone wanted on their group project? That's Johann Persaud. NBC 6's Ari Odzer reports. The Coral Park High School robotics team is perennially one of the best in the state of Florida. Part of a magnet program, the Rams always attract talented engineering students such as senior Johann Persaud. "I consider myself a leader, I like to take the initiative and be the one to go out and start whatever is it that needs to be started," Johann said. Remember the kid from high school who everyone liked and everyone wanted on their group project? That's Johann. 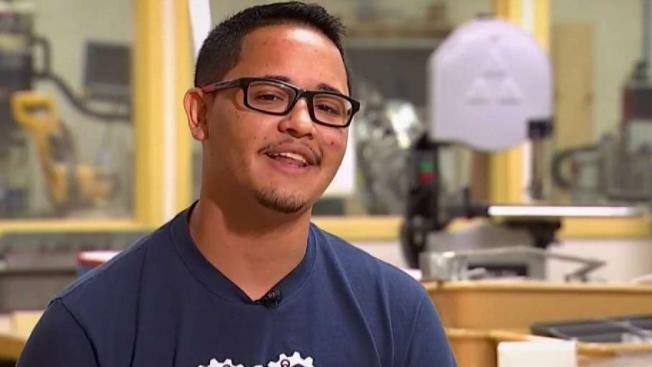 "He fosters a sense of like, camaraderie among everyone he works with, he's really good at working with people," said classmate Romeo Martinez. "A lot of the kids, like when they see him, they're like, oh he is one of the top people, they want to learn from him, they want to be around him," added another classmate, Cyler Delahoz. So Johann is obviously a leader and a key part of the robotics team here at his high school but his biggest contribution is being made across town, at Kendale Lakes Elementary School. What started as a one-time visit in freshman year turned into a major commitment. "I'm just as much of a kid as they are, I like working on the robot with them," Johann said. Johann has been mentoring fourth and fifth graders at least once a week for four years, teaching them the basics of robot design and programming. It's why he's a Silver Knight nominee and in the running for the school district's Student Volunteer of the Year. "They wanted to understand the robot, they wanted to know the physics behind it, and I felt that if I was there I'd be able to provide them with that knowledge and enable them to not only win but really be able to learn," Johann explained. "They know what they want and they're able to pursue it, so when I see that and I see that I'm able to help them and get them where they want to be, that rewards me, too." Did I mention Johann is an Eagle Scout? No wonder they love him at Kendale Lakes, he also designed and built the school's thriving butterfly garden. Academically, Johann is in the top five percent of his class. He has full scholarships waiting for him at UF or UCF, he hasn't yet decided where he wants to pursue engineering. But it's outside the classroom where this young man really makes waves. "He's a good student but it's his character that really makes him special," said engineering teacher Charlie Delahoz. Johann has a technical, problem-solving mind a big heart. You couldn't engineer a better combination.